The Executive Secretary of the National Accreditation Board, Dr. Kingsley Nyarko, has entreated the University of Cape Coast to build the capacities of lecturers in the various tertiary institutions in the country to acquire professional skills in teaching. Dr. Nyarko noted that though most lecturers in tertiary institutions have either acquired PhDs and Masters with research, the majority of them do not have the skills in teaching to handle students at the tertiary level. 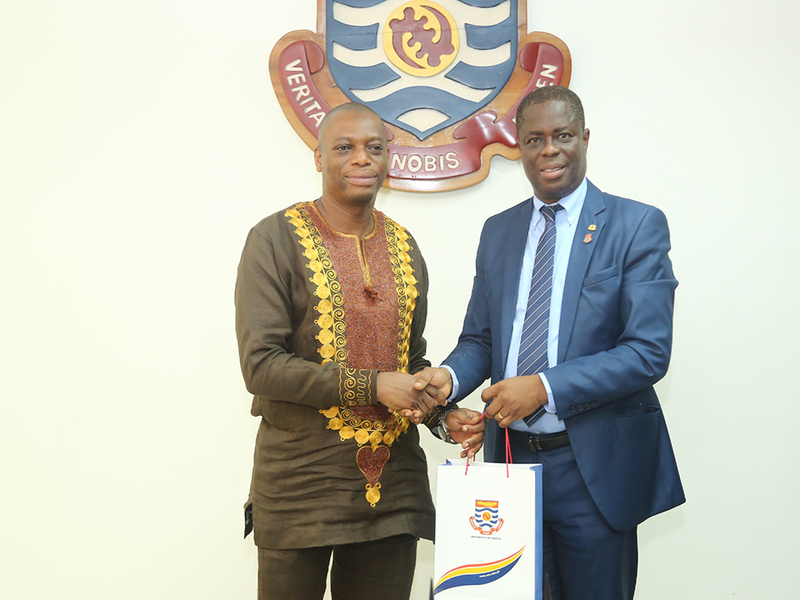 The Executive Secretary of the National Accreditation Board made the appeal when he called on the Vice-Chancellor of the University of Cape Coast, Prof. Joseph Ghartey Ampiah. Dr. Nyarko said UCC is a major stakeholder and the first University with the mandate to train teachers for the various levels of the education sector. He, therefore, called on UCC to intervene in equipping lecturers to impact positively in their students through teaching. The NAB boss expressed worry about students engaging what he termed as consultants to do their assignments, research work and other tasks assigned them. He said such an attitude has an implication on the quality of graduates tertiary institutions are producing. Dr. Nyarko was accompanied by the Deputy Executive Director of NAB, Mr. Saaka Sayuti; Public Relations Officer, Mr. Lawrence K. Ashia and Mrs. Hagar Thompson. In his response, the Vice-Chancellor of UCC, Prof. Ampiah said the University has already designed a programme known as “Teaching in Higher Education” for teachers in the various tertiary institutions. Prof. Ampiah said UCC would soon send documents on the programme to the NAB for accreditation. He called on the executive director to expedite action on the document so that it can be approved for the programme to begin in the shortest possible time. Prof. Ampiah said UCC was ready to assist the NAB and other regulatory bodies to ensure that lecturers in the country acquire the relevant expertise to teach and assess the diversity of students at the tertiary level. Present at the meeting were the Registrar, Mr. John Kofi Nyan; Provost, College of Education Studies, Prof. Eric Magnus Wilmot; Director, Academic Affairs, Mr. Jeff T. Onyame; Director, Centre for Teaching Support, Prof. Rosemary Bosu and Assistant Registrar, Public Relations and Protocol Section.